Portland-based musician and beat-smith Alias (born Brendon Whitney) has been active on the abstract hip hop scene for almost ten years. With a handful of albums under his belt, he is one of the pillars of the avant-guarde hip hop / electronica label anticon. 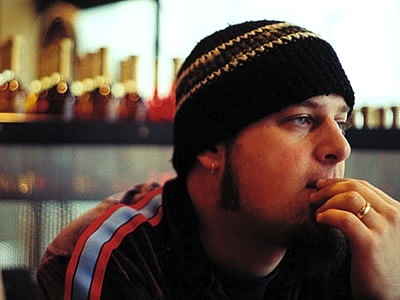 In 2002 Alias concocted his first album, a rap-heavy, poetic and brooding introspective record called The Other Side of the Looking Glass, which was followed by his moodier Eyes Closed EP and Muted full-length (2003). In 2005, Alias collaborated with little brother Ehren to produce an instrumental LP named after their grandmother, Lillian. 2006 brought a new Alias-anchored duo, this time in collaboration with New York electro chanteuse Tarsier (Rona Rapadas), and the album Brookland/Oaklyn. Finally in 2008, Alias released Resurgam, an album of heavy, intricate rhythms and impressive melodic breadth. The album is also notable for its two collaborative tracks, such as “Well Water Black” which features the falsetto croons and low-toned poems of WHY?’s Yoni Wolf. Alias is also a talented remixer, whose work has been embraced by critics across-the-board. His list of contributions includes remixes for the likes of The One AM Radio, John Vanderslice, Christ, My Brightest Diamond, 13 & God, Son Lux, Lali Puna and Lunz.